Maybe the name of a village? Can it be some kind of a harvest festival? Great idea. It never dawned on me that “Nelson” may be the name of a town rather then the name of a person. The cabinet card gallery is fortunate to have such a great group of visitors who are willing to share their wealth of information and creative ideas and hypotheses. A little research quickly revealed that there is a town in Illinois named “Nelson”. However, it is located 126 miles from Mason City (the location that this photograph was taken); making it less probable that the “Nelson” in this image is Nelson, Illinois. What a unique portrayal you found! 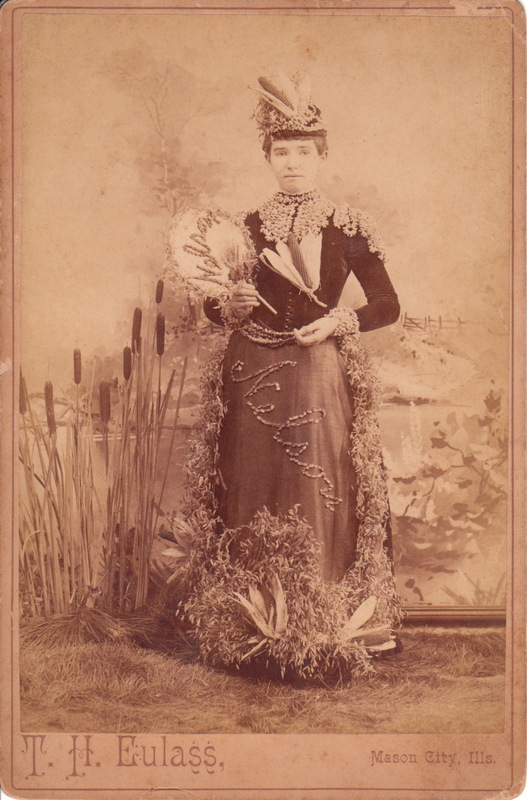 I notice she is proudly sporting a few dried corn cobs, on her bodice and at the base of her dress and hat, but also that the feathery items look to me like wheat or some other grain, so perhaps the earlier comment about a harvest festival, or farm show theme would be apt indeed. I agree, that these are rather corn cobs and other grain in the picture. There is the College of Agriculture at the University of Illinois in the twin town of Urbana-Champaign, which is not so far away from Mason City. I read a little about the history of the U of I (opened in1868) and the College and visited the archive. They had mixed classes in former days. And there were May Day Festivals, where some would dress up as Corn Maidens (pictures of 1915 in the archive). Besides other Campus activities. So I think it could be possible, that the picture shows a student of the University, her hometown being Nelson. “Nelson” was a seed company at one time–among their offerings to farmers was seed corn (I only know this because my grandmother once had an empty Nelson seed corn bag that she cut up and made into kitchen towels). Have no idea whether they are still in business. Thanks to the above comment of Ross and after browsing the extensive website ‘LUMINOUS LINK’ of Alan Griffiths I believe this is an advertising cabinet card for the Nelson company. Alan has a chapter on the BANNER LADIES and CABINET CARDS: ADVERTISING and displays collections of cabinet cards. And there is lots more to discover! I sure do like his website! Yes this is a banner girl,for a business with the name “Nelson”. They walked in parades and presumably attended other local events, Good detective work! I’m still looking for any diaries or nineteenth century publications that describe them. Thanks for posting this and thanks for letting me know Susanna.